With his team in a need of a victory to get a firm grasp on a Top 16 spot, Rok Stipcevic used a career-best performance to lead Rytas Vilnius to a 96-101 overtime road win against Fiat Turin, and in the process earn himself the MVP honor for Round 9. 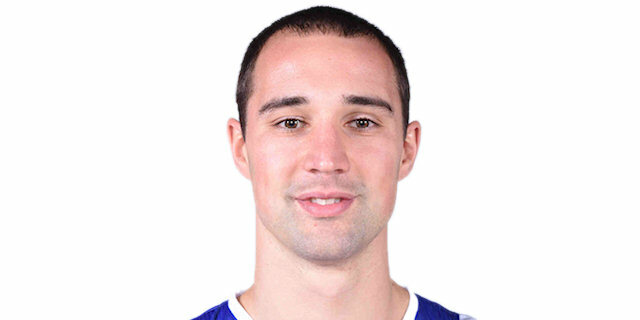 Stipcevic, who debuted in the 7DAYS EuroCup as a teenager in 2004, had career highs of 6 three-pointers made, 31 points and a 41 performance index rating in the victory. He also made 3-of-5 two-pointers and 7-of-7 free throws while collecting 5 rebounds, 4 assists, 3 steals and 5 fouls drawn. His 41 PIR tied the highest mark in the EuroCup this season was the second-highest ever for Rytas, which has played 154 games in the competition. 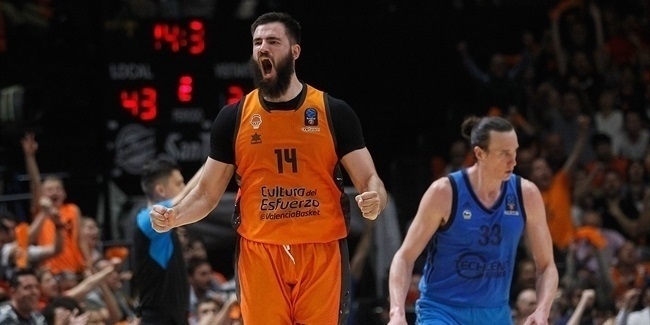 The first MVP of the Round honor for Stipcevic, 32, came in his 61st career EuroCup game. Pierria Henry of UNICS Kazan had Round 9's second-highest PIR, 34, based on his 19 points 8 assists, 6 rebounds, 3 steals and 7 fouls drawn in an 87-84 home win over Unicaja Malaga that clinched first place in Group D. Sammy Mejia of Tofas Bursa came next with a PIR of 30 in his team's loss against Limoges CSP. Mejia collected 21 points, 8 rebounds and 4 assists, while in that same game Limoges forward William Howard collected 19 points, 7 rebounds, 3 assists and 2 steals for a PIR of 28. Rounding out the top five performances of Round 9 is Turk Telekom Ankara center Vladimir Stimac, whose 20 points and 10 rebounds in a win over Dolomiti Energia Trento gave him a 28 PIR. Stipcevic scored 31 points to top all scorers in Round 9. Sergey Karasev of Zenit St. Petersburg, who did not play this round, remains the EuroCup's scoring leader with 19.7 per game. 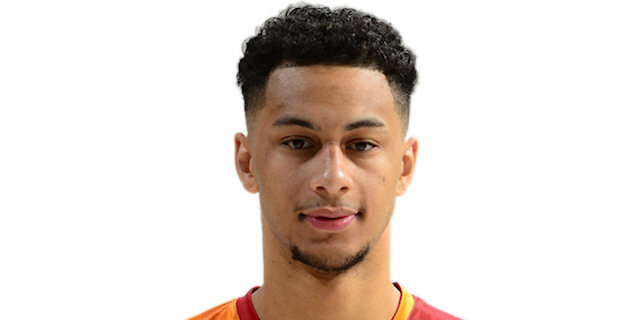 Zach Auguste of Galatasaray Istanbul pulled down 13 rebounds, the most of all players this round. Mouhammad Faye of Crvena Zvezda mts Belgrade leads all rebounders this season with 7.7 per contest. Trento playmaker Aaron Craft dished 11 assists to lead Round 9. 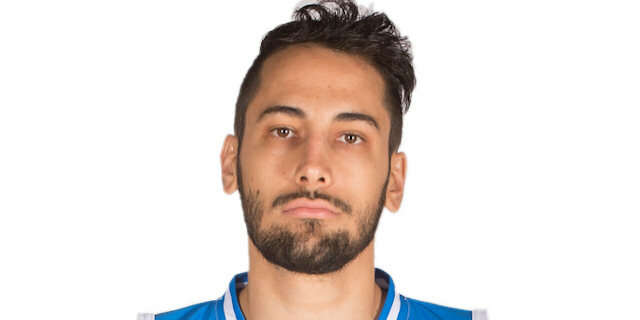 ALBA Berlin's Peyton Siva, who dished 10 assists in his return from injury, leads all players with 10.2 assists per game. 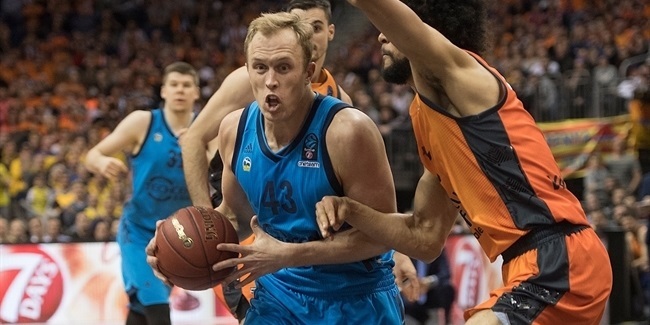 His teammate Luke Sikma had the most steals, 6, in Round 9. 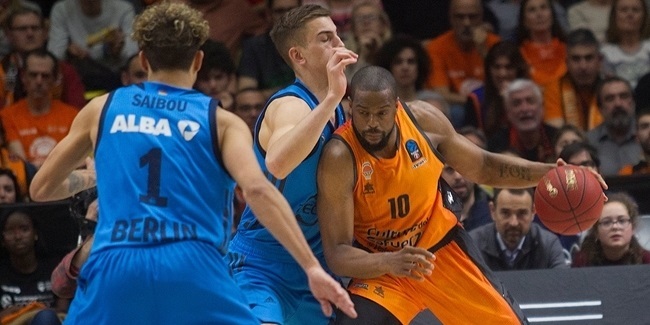 Javonte Green of ratiopharm Ulm is the EuroCup leader in this category with 3.5 steals per game. Jeff Withey of Tofas had 4 blocks to lead all players this round. Robert Upshaw of Arka Gdynia is the competition leader, averaging 1.9 blocks.